The Lusitano Riding centre is a new centre in Portugal which has been operating for over 12 months and just 40 minutes from Lisbon. Situated in a typical old Portuguese village surrounded by vineyards, stunning landscapes with beautiful Montejunto mountain views. 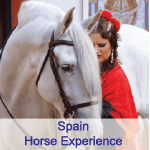 At the centre you will ride Lusitano horses, well trained in Dressage and Working Equitation. Classical Dressage needs no introduction and Working Equitation is now becoming very popular in Australia. Working Equitation aims to show off and utilise the working capabilities of the Luistano horse and competitors have to compete a gymkhana type event as well as a dressage test. In this event competitors have to negotiate obstacles such as bridges, gates and jumps. At high levels they may have to work with cattle or split a cow from the herd. Working Equitation lessons are available during the spring/summer whereas classical dressage lessons are available all year round. No previous experience in Dressage or Working Equitation is necessary, as lessons are offered on very well-schooled horses suitable for novice (Must be able to walk, trot and canter) up to experienced riders. The Lusitano horses are trained in Dressage and Working Equitation disciplines. As a guest you will have the opportunity to learn all the Grand Prix exercises on our Lusitano horses and all obstacles from Working Equitation, and you are able to choose the discipline or make a mixed programme. Depending on your chosen programme, you will have either one or two lessons per day. The lessons are given on schoolmaster horses, for 1 hour and maximum 2 riders per lesson. All horses are very well trained in all dressage exercises: all Lateral Movements, Passage, Piaffe, Flying Changes (4, 3, 2, 1 tempi), Spanish Walk and Pirouette’s. The instructor, João Batalha, has been teaching classical dressage for more than 6 years in Portugal and other countries in Europe. After several years teaching in one of the most renowned schools and riding holiday centres in Portugal, he now shares his time between teaching exclusively at our Lusitano Riding Centre and competing at national level in Portuguese Equitation and Working Equitation. Tack type: Traditional Portuguese or Dressage saddles with simple snaffle or double bridles. Lessons are one-hour duration and there is a maximum of two riders in each lesson. This property is a small boutique property and the accommodation is on-site at the farm where there are four tastefully decorated rooms. All have private bathroom, TV, air conditioning and Wi-Fi. The rooms are all double/twin but extra beds can be added to rooms on request (at additional cost). The dining room has a panoramic view across the Portuguese landscape. All meals are included and lunch and dinner are usually two courses and include a starter followed by either fish or meat, together with accompanying salads and vegetables. The meals are typically Portuguese and include coffee or tea, water and juice. There is also local wine included with the evening meal (approximately one bottle between two people). Check-in: Between 2-6pm at the farm and check-out is midday. Open all year round (Closed 24 December – 1st January). You may arrive and depart on any day. Minimum three night stay and longer stays are recommended. For novice riders on a “Learn to ride programme” are generally recommended to stay at least 5 nights. Note: Transfers can be arranged locally for 55 euros per vehicle (max 4 passengers) and paid locally. Rates are based on the Euro and subject to currency fluctuation, so please contact us for the most up to date pricing in Australian dollars for your riding holiday. The Lusitano Riding centre is located 40 minutes from Lisbon Airport and 50 minutes from Lisbon city at Quinta de Palhacana – Pereiro de Palhacana. Warm and dry for most of the year. During July & August temperatures can reach the late 20’s°C or early 30’s°C. The wettest months are October to March when it can also feel a little chilly, particularly in the evening. The farm is situated in the Western wine route and your hosts are develop relationships with some of the wineries where you can go and taste some typical Portuguese wine. If you have a car you can go and visit Santa Cruz beach which is just 30 km away. Close by are typical villages to explore and some of the typical tourist areas are Mafra – 33 km, Ericeira – 45 km, Lisbon Portuguese School of Equestrian Art – 45 km, Obidos – 50 kms, Sintra – 53 kms. The farms driver is available to take you to these sites by prior arrangement and must be pre-booked and paid for locally.